While most couples go out for cocktails and dinner on their anniversary, my husband and I headed to the Lakewood Center of the Arts to attend the open forum regarding the Lake Oswego Streetcar Project. We waited three hours so I could testify my support. It was well worth it and over eighty people stood up and shared their approval of this very important improvement to our city. 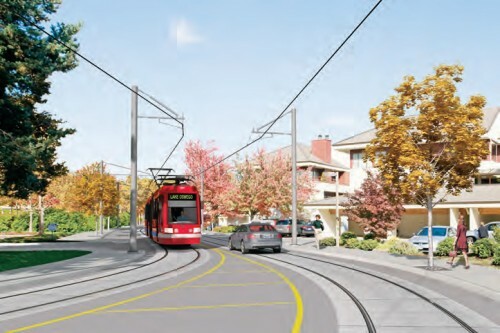 If you have not yet publicly supported the Streetcar and you missed the forum – don’t worry you still can contribute! But you need to hurry, the open comments are set to close on Jan. 31st. Click the link below and show that, you too, are behind this progressive endeavor to move our community forward! and for more info go to Next Stop Lake Oswego. As for the rest of our anniversary evening…well, we ended up having a wonderful dinner at Tucci‘s, who in my opinion, still have the best steak in town! The wine didn’t hurt either!